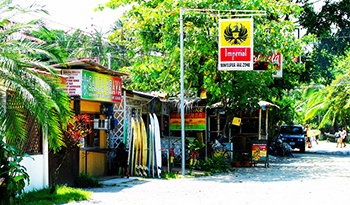 As a Caribbean coastal town completely removed from the noise of the city, Puerto Viejo serves as the perfect getaway. Reggae music and crashing waves quickly replace the sound of beeping car horns. Puerto Viejo is known for its pristine Caribbean beaches, family-run shops and restaurants, and some of the best nightlife in the country. The amenities, lifestyle, and crystal clear water make Puerto Viejo one of the best Caribbean beach towns in Costa Rica. Puerto Viejo offers primarily simple, one-family beach homes. Properties located in the heart of Puerto Viejo are typically priced higher than those located a few blocks off the center street. More elaborate homes are available close by in Playa Chiquita and Punta Uva (Punta Uva is home to the Banana Azul Beach Club, which offers food and drink delivery to the beach, lounge chairs, and wifi). The homes on the surrounding beaches about a 5 minute drive from Puerto Viejo are often more modern and spacious. Regardless of which of these areas one chooses, the Caribbean coast and its laid back attitude is sure to relax and enhance the senses.